I started blogging in September 2009 and I can see such a huge movement in where my blogging has gone since the beginning. At first, my blog was all about my recipes. I did not even take photographs. All I wanted to do was share my recipes. I was not a writer, just a cook. I then moved along to taking photographs with my cell phone and the next step was to get myself a camera and a tripod. My blog is still all about my recipes, but now along with a list of ingredients and what to do with them, I share my thoughts, musings and memories. I edit my photographs and add my name to them – one because I am proud of how my photographs continue to improve and two because I want to stop other people scraping my photographs as has happened in the past. One of the things I am most proud of is that I have been asked by Woolworths to write blog posts for them, with recipes. In January I wrote about grapes. 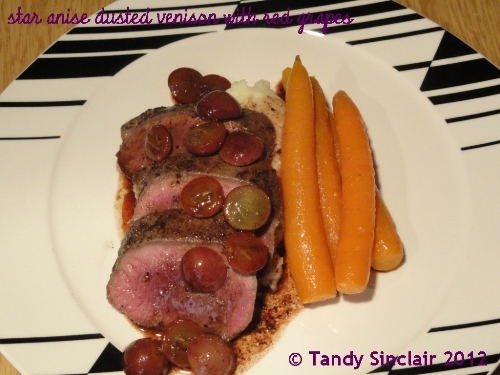 This recipe was inspired by the fact that Woolworths do such lovely venison. I decided to pair the sweet red grape variety, Flame, with some venison fillet. Given that venison and grapes are complimented by star anise I used this as the flavour base for my dish. This spicy meat will go well with a glass of Shiraz. What a lovely & festive venison dish! I absolutely adore venison cooked correctly! That grape sauce is a real winner too! 🙂 Yum! Now I’m hungry…Yes, I can see where Pork would probably be more complimented with the grapes and Star Anis, than Beef, but, I bet I wouldn’t walk away from the table with a plate still full of either…Great looking recipe. Kudos Tandy – what a fantastic feather in your cap. This is a brilliant recipe! Congrats Tandy! And very well deserved!! This is another fabulous recipe! Since I don’t have any venison, I’ll take your suggested for using pork!! Congratulations on the Woolworth’s thingy. What a great compliment, and well deserved, Tandy. This recipe sounds so delicious. I agree with Chica that the name sounds really romantic. I think I will probably use pork though. Saw that you posted this on the SRC FB page. We eat a lot of venison… going to try this one! I love this one and am looking for new ways to use venison. Thanks. This recipe looks wonderful. Congrats on the Woolworth’s blog. One thing, I followed your link for scraping, and then followed the links to JO’s brownies and the other one, but I think that link had changed, because I couldn’t find any brownie recipe in there or any post prior to November 2011, for that matter… I put my name on my photos too, don’ like scraping neither. Even the name of the dish sounds so romantic! The dish is gorgeous, I´d probably have to use a beef fillet (if I could get hold of one) but I love the flavours in this dish. beef fillet would work just as well, but pork might be even better!